Pyrrho (360 – 270 BCE), the greatest skeptic of ancient Greece, was from Elis, Northwest of Athens on the Dorian peninsula. Diogenes Laertius says that Pyrrho was originally a painter, an interesting profession for a thinker who argues that reality is appearances and human judgements are images that never fully capture the original. Originally, the word ‘skeptikos’ meant ‘inquirer’, someone who investigates matters continuously. As we have discussed with previous thinkers such as Xenophanes, Heraclitus, Democritus and Socrates, skepticism is often portrayed by more dogmatic thinkers as a pessimistic nihilism, a dreary attitude that no knowledge is possible, but skeptics are often quite optimistic about seeking wisdom within oneself and throughout the cosmos. While skeptics are relativists, critical of claims to absolute universal knowledge, skeptics are passionate about seeking relative truth, which they argue is a continuous source of insight and engagement. Clearly, “inquirers” believe that there is no end to inquiry, no end to what we can discover. 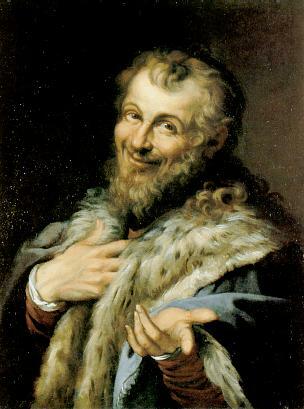 As a young painter, Pyrrho became fascinated with philosophy through the works of Democritus, the atomist who was quite skeptical of human judgements in spite of his atomic theory. Democritus said, “Reason is a powerful persuader”, and about the gods and the workings of the heavens, “Man is what we know”. Critical of knowledge, said we should have much thought rather than much learning, and said, “In reality, we know nothing, for truth is in the depths”, arguing that we must remind ourselves that we are always relatively removed from the reality that surrounds us. This is similar to Heraclitus, who wrote, “Nature loves to hide”, and “Things keep their secrets”. Also, like Heraclitus, Democritus said, “The world is change, life is opinion”, and “The world is a stage, life is our entrance: You came, you saw, you left”. Pyrrho also was acquainted with the paradoxical thought of the Eleatics, which he learned from the Megarian School, founded by a follower of Socrates. Pyrrho traveled with his teacher Anaxarchus, also a follower of Democritus, and Alexander, student of Aristotle and emperor, to Persia and India, some sources say as a soldier and others as a scholar. Alexander failed to conquer India, unlike he had Egypt and Persia. It is said that Pyrrho learned from the Persian Magi as well as Indian ‘gymnosophists’, a strange term meaning those who trained and studied both gymnastics (likely yogic postures) and philosophy. These could have been Jains, who were known for logical debate as well as extreme practices of bodily discipline, sometimes fasting while standing in the jungle for days. 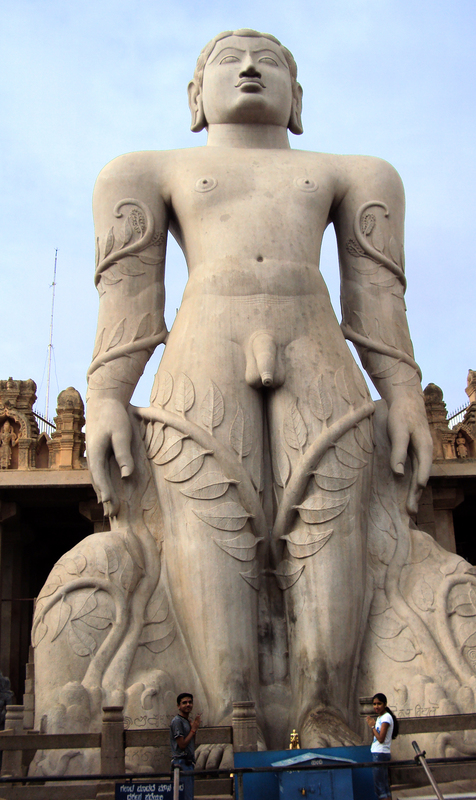 Statues of Jain teachers frequently show vines growing up their very naked bodies. Sources say that one Indian gymnosophist set himself on fire to go willingly to death, terrifying Alexander and his entourage. 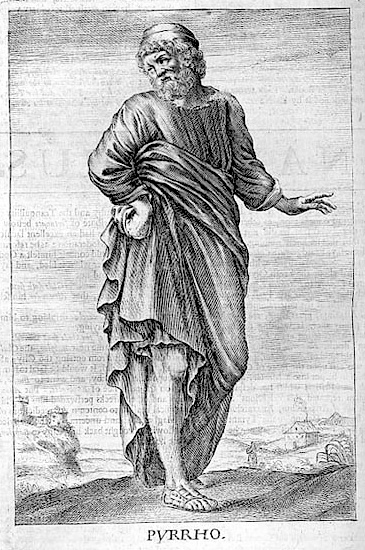 After returning to Elis, Pyrrho chose to live a simple life of poverty, but he was known both in Elis and in Athens for his skill at debate, and the Athenians went so far as to offer him citizenship and construct a statue to his honor after his death. The people of Elis offered Pyrrho the job of chief priest, believing his command of truth to be divine, and to honor him made philosophers exempt from taxation. Pyrrho wrote nothing, though his work was recorded by his student Timon (not the meercat of The Lion King), and then his skepticism was elaborated much later by Sextus Empiricus, from whom we know of Pyrrho’s thought today. Jains, good candidates for the gymnosophists Pyrrho met in India, advocate two principles that are shared with Indian thought but credited to Jain innovation: anekantavada, the multiplicity and relativity or “non-one-endedness” of reality, and syadvada, the hypothetical and imperfect nature of perspective and judgment that is always the fiber of human truth. 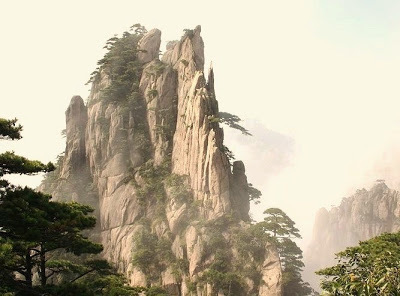 According to these two principles, all human beliefs and judgments are temporary and partial views of each particular thing, including the self and the cosmos. 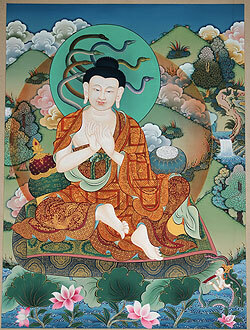 Jains, like Buddhists, believe that things may or may not be as they seem and may or may not be expressible as they are. Pyrrho’s skepticism is summed up under the term ‘acatalepsia’, withholding judgement. Like Zeno, Pyrrho taught that any belief can be countered by the opposite belief which contradicts it. Thus, like Jains, Pyrrho held that reality is not one-sided, like human judgements, and that all judgements are partial and should be treated as hypothetical, as a best guess. While some in ancient or modern times might accuse Pyrrho of being a sophist, of being a destroyer of truth who merely argues any side skillfully but without genuine pursuit of the truth, Pyrrho, like the Eleatics and Socrates, believed that seeing the limitation and contradictions inherent in all sides of the truth, in all positions of human judgement, brings one closest to the full truth, giving one the god’s eye view, as far as mortally possible. Recall that Aristotle said that skeptics are no better than plants, preferring universal certainty. Just as Socrates’ knowledge that we mortals are ignorant was considered divine (as we saw in Plato’s Apology and Symposium), Pyrrho, like Parmenides in Plato’s dialogue of that name, argued each side knowing that each side was ignorant and limited. Just as Socrates in Plato’s Meno argued that we can pursue the good, though we do not know what it is, both knowing and not knowing it, Pyrrho put this into practice like Parmenides, showing that each side of any argument is simultaneously a knowing and not knowing, both true and false, as is the opposing side. As evidence of this, Pyrrho pointed to the continuous fact of differences of opinion amongst both the foolish and the wise, constant argument among both the educated and uneducated, the common and the distinguished alike. Pyrrho argued that each thing is both this and that, and neither this nor that. 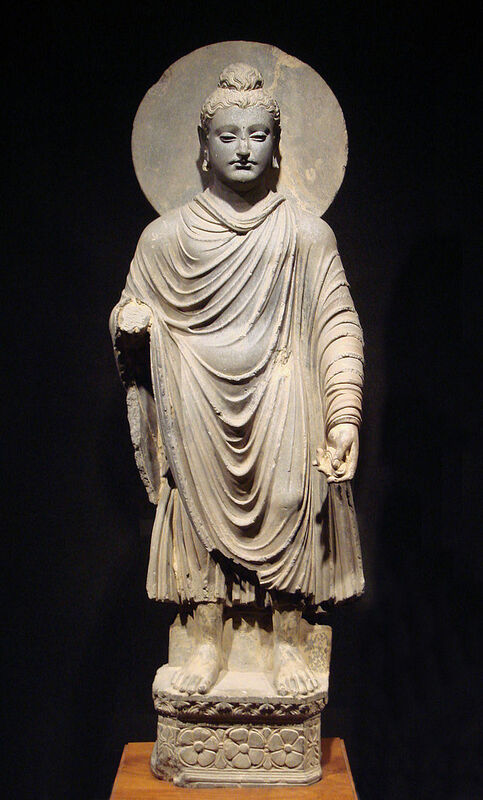 This is very similar to the great Buddhist logician Nagarjuna, who argued that each thing or judgement is, is not, both is and is not, and neither is nor is not. Consider the example of a fire being hot. Because a particular fire is not simply hot, but only relatively hot (cooler than the plasma in a star, for example), it is also correct to say that the fire is not hot, insofar as it is not simply or entirely hot. Similarly, then, it is also correct to say that the fire both is and is not hot, both to a particular extent. Finally, because the fire is not simply or exclusively hot or not hot, it is correct to say that the fire neither is nor is not hot. Recall that Plato’s Parmenides told Socrates that if one practices this sort of dialectical exercise, one will grow wise and come to see the truth of the forms of things. Pyrrho may very well have found this sort of exercise in debate with Indian logicians and brought it back to Elis, even though it already existed in Athens in the works of Plato. Legend has it that Pyrrho could defeat anyone in argument, then take his opponent’s position and defeat his own. He could do this because he knew that human truth was fundamentally one-sided, and so could not eliminate opposition. Pyrrho believed that seeing this theoretically and then putting it into practice, exercising as Plato’s Parmenides suggests, brings peace of mind and freedom from fear, what Pyrrho and later Pyrrhonians called ‘ataraxia’, a state of tranquility. If one is attached to neither side of an argument, then one has nothing to fear if either side is asserted or denied. Because things are non-one-sided, appearing to us as one-sided but then as two-sided, we must ask ourselves what our relationship is to the truth and how we should approach life. 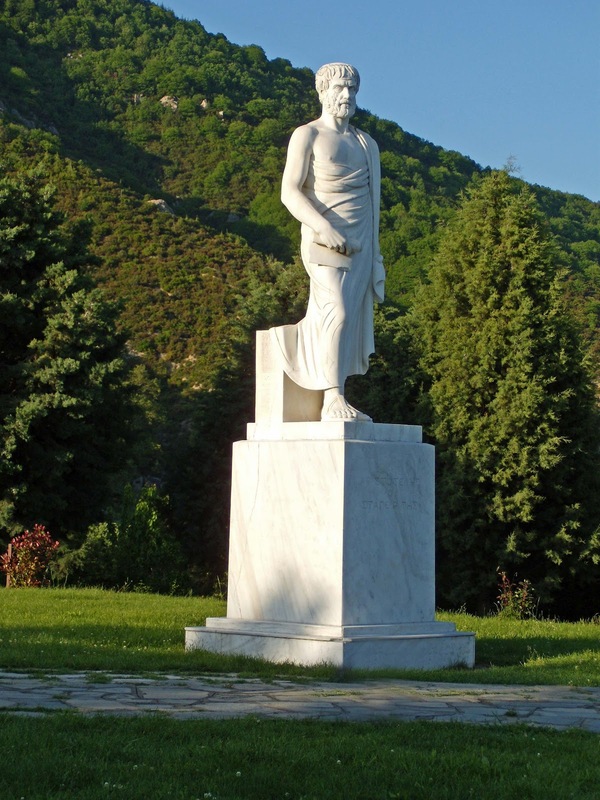 Pyrrho believed in a life of simplicity and being emotionally detached and at peace, similar to Greek philosophers we have already studied, as well as the Epicureans and Stoics we will study next week, who while disagreeing with Pyrrho also believed that the practical goal of life was attainment of ataraxia. 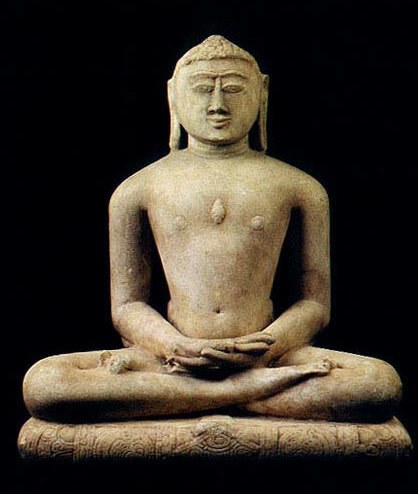 It is also very similar to Buddhism, which took much from Jainism. Some sources, critical of Pyrrho, said that wherever he went he needed to be chaperoned by friends so that he would not skeptically try to walk off the sides of cliffs or in front of chariots and wagons. It is likelier that Pyrrho could argue that one could pass through a chariot or walk through the air without feeling it necessary to prove this physically, and this story was told by more dogmatic thinkers who Pyrrho angered with his skepticism. It is true that no chariot or wagon is absolutely solid, nor is walking off a cliff certain death. While Pyrrho argued that our understandings are mere appearances, this does not mean that one should act as if appearances are entirely unreal. 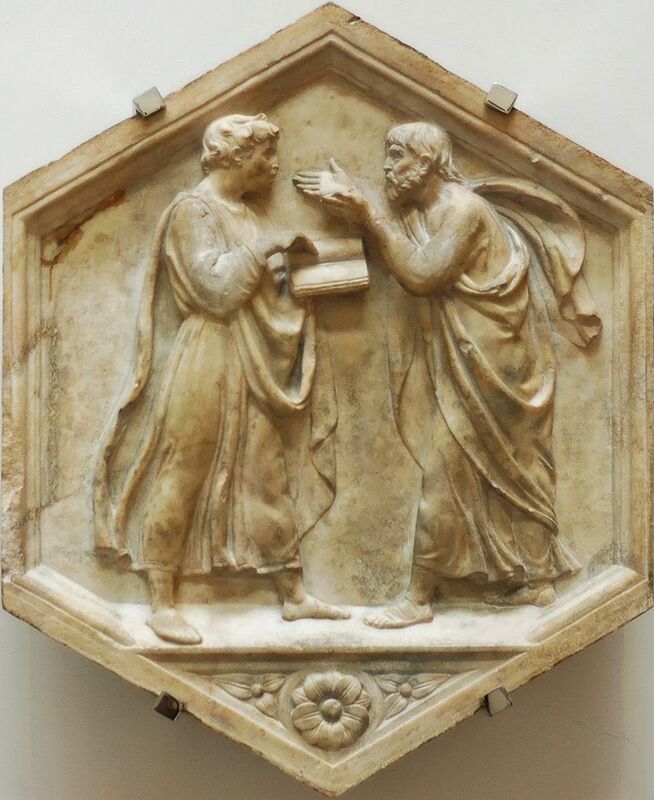 Aenesidemus founded Pyrrhonism or Pyrrhonian Skepticism as a school in the first century BCE. Continuously angering more dogmatic thinkers and schools of thought, Pyrrhonians were known for relativising every assertion with, “It seems that…”, or “It appears to me that…”, rather than state categorically what is the truth. Critical of the logic of Aristotle and his Peripatetic school, the Pyrrhonians argued that there were no truths that could be absolutely asserted (All X is Y) or absolutely denied (No X is Y). All that we can know, given our limited perspective and ability to gather knowledge through experience, is what can be relatively asserted (Some X is Y) or relatively denied (Some X is not Y). Here, there is an interesting difference between our use of the terms ‘general’ and ‘universal’, both of which Aristotle applied to absolute assertion and negation. When we say ‘universal’, we mean absolute, but when we say ‘general’, this can also mean relative. Thus, for Aristotle, to say, “X is generally Y” means X is always Y, but we can read that as saying, “X is relatively and mostly Y”. While Pyrrhonians did not deny this second sort of statement, asserting or denying something predominantly, they would deny Aristotle the ability to make universal statements, which he would also call ‘general’ statements.